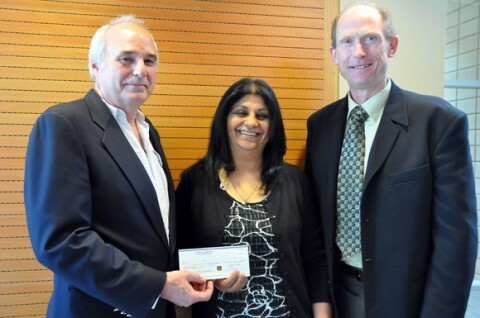 Dr. Allan Jones, Associate Regional Dean, Southern Medical Program, accepts a cheque for $30,000 from Dr. Sue Randhawa and Dr. Brian Brodie, President, B.C. Medical Association, to create the Southern Medical Program's first scholarship endowment. The B.C. Medical Association and the B.C. Medical Foundation have created the first endowed student award for the Southern Medical Program (SMP) at UBC's Okanagan campus. The Dr. Gary Randhawa Memorial Scholarship in Medicine is established in honour of Dr. Gurmeet Singh "Gary" Randhawa, who was a past member of the BCMA Board of Directors and president of the Kelowna Medical Society. Dr. Randhawa, who died of cancer in January 2008, was a pathologist in Kelowna and recognized by colleagues as a leader in the medical community, always advocating for patient care. "UBC's Southern Medical Program will emerge as a major player in both the education of health professionals and also in the pursuit of health research in the province," says Dr. Allan Jones, Regional Associate Dean, Southern Medical Program. "The establishment of this first scholarship will contribute to our goals of ensuring highly qualified candidates will continue to have access to medical education, and consequently contribute to the advancement of quality care within our communities -- local and global." The 2011 MD Undergraduate Program admissions cycle opened June 1, and will admit the first class of SMP students in May 2011. The program offers 32 seats to incoming students, who will complete their first four months of training in Vancouver before moving to their new home in the Interior. The endowment, $1,000 per year, will be available to a student enrolled in the Southern Medical Program during any academic year of study, with preference given to those with a record of community service in health care. The first scholarship will be available for the 2011/2012 winter session. "The B.C. Medical Foundation is honoured to establish this scholarship as a tribute to Dr. Randhawa's life-long work and vision in furthering health education and health promotion in local communities," says Dr. Brian Brodie, President of the B.C. Medical Association. "His energy, enthusiasm and commitment to multicultural health and wellness was widely recognized, particularly through the establishment of health fairs in many communities with the help of local physician volunteers, other healthcare professionals and community leaders". Supporting a medical student at UBC Okanagan, in the community where Gary lived and worked, is an appropriate and meaningful legacy."